A highball glass is a tumbler that’s capable of handling between eight and 12 ounces of liquid. Their more common purpose is for highball cocktails, mixed drinks, and refreshing summer’s day drinks. In most cases, a highball glass is taller than regular glasses, but broader and more stumpy than a Collins glass. With this in mind, you will come to realize that many drink glasses try to pass themselves off as a highball glass when they are not. Weed through the mistruths to find the best highball glass to suit your needs. These options below could be worth a closer look. Even though you have to pay a bit more for this highball glass set than you would many others, you will soon realize why. Unlike their cheaper counterparts, they are sturdy and ready to provide you with years of faithful service. These highball glasses come in a box of 12, all of which hold 15 ounces of liquid. You can also choose whether you want to buy them in packs of two, three, or four. High quantity options are convenient for the hospitality industry that relies on durable, hardy glassware. This highball glass set is also made in America, giving some people peace of mind that they are high-quality. The most standout point, however, is how beautiful they are. They layer well with dinnerware, are crisp, clear, and sleek, and you can pair them with almost anything. What’s more, when the time comes to wash them, you don’t have to try to squeeze a kitchen cloth into the stout base. Instead, these are dishwasher safe for your convenience. All anyone asks for is a hot or cold beverage, but if you don’t own a highball glass, your cold drink ends up warm, and your warm drink ends up cold. That’s why you may like to check out this set of two highball glasses from Sun’s Tea. Because they have two walls of borosilicate glass instead of the more traditional one, your beverage remains cold or hot – depending on what you want – for as long as it takes to drink it in an average sitting. The double walling also helps to give the glass strength, meaning you might be able to stop it from breaking or cracking long before your regular glasses do. 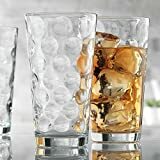 The sleek style of this highball glass set is also another standout feature, as is the convenience of being safe for use in the dishwasher and microwave. You’ll never have to wash these glasses by hand again! They also come with a six-month warranty in case there are manufacturer issues you’d like them to rectify. There are only two things that might put you off buying this highball glass pair. The first is the size. While they supposedly hold 16 ounces, consumers have proven that to be false. What’s more, it’s quite a high price tag for only two glasses. It can be a challenge to find highball glass sets that have a competitive unit rate price, but Libbey comes to the party in more ways than one. Not only is the unit rate exceptionally affordable, but you get to choose whether you buy the highball glasses in sets of 12 or 24. Such a set is convenient for an event, party, or wedding that doesn’t require overly durable glasses. They look classy, elegant, hold 16 ounces of liquid, and you can use them for hot or cold beverages too. Sealing the deal is the beautiful diamond swirl pattern and the convenience of being able to put them in the dishwasher. What may be a bit of an annoyance, however, is their fragility. While the glasses are going to hold up fine for an event or wedding that you won’t necessarily need them back from, the glasses are not ideal for the family home. The glass is thin, fragile, and even putting them into the kitchen sink can chip and crack them. They are also narrow which, if you clean your dishes by hand, makes it nearly impossible to get a cloth down. If you have young children or require thick glasses, this highball glass set might not be for you. 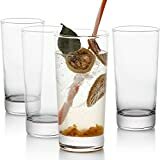 Aside from shipping and handling posing risks for this highball glass set to arrive in one piece, you are going to love everything about these glasses. Of course, you have to be willing to take the risk of them coming with none broken! Once they arrive (and hopefully in one piece) you can give them a whirl and see all the excellent features they have to offer. Their generous 16-ounce capacity makes them more than suitable for alcoholic and non-alcoholic beverages, and a quick measure determines you can almost get 17 ounces in there too. They have a substantial base to reduce the risk of breakage, and a broad rim for making cleaning a breeze. However, if you don’t want to clean this highball glass set by hand, you don’t have to. The set is entirely dishwasher safe for technology to do all the work. This set of ten highball glasses is going to impress with its style too. They are sleek, clean, bright, and have none of the frills that can detract from the pureness. 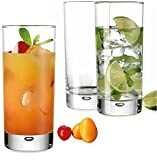 If you are in the market for robust highball glasses that will handle daily use, check these out from Le’raze. There’s nothing wrong with treating yourself from time to time, so why not let it be with this highball glass from Schott Zwiesel? As a German-made glassware set, it’s at the top of the food chain when it comes to class, style, elegance, and functionality. They look the part, but they can back it up by being a functional highball glass that does what you need it to do, and more. The first thing you will notice is the style. They come in a set of six advertised as Paris Barware, so you will find they are more suitable for bars and elegant kitchens. They are also bright and shiny and will remain so thanks to the break, chip, and scratch resistance coupled with the thermal shock resistance. That’s not all this highball glass set has to offer either. Their glass is unlike many others on the market. It features triton crystal glass with titanium zirconium oxide to keep the set looking at its best for longer. Put them in the dishwasher and let them come out looking as good as new. The only thing to be aware of, however, is the top of the glass is fragile and can break. Given the price tag, you may like to take extra care to avoid that happening. Regular 16-ounce highball glass sets are okay, but you have to keep refilling your glass! Do so less with this 18.3-ounce highball glass from Schott Zwiesel. Known as a cocktail glass, it’s a premium product that will complement your bar or kitchen setup effortlessly. It looks striking, has a massive base, and could be a display item as well as a functional glass for cocktails and similar beverages. This set of six also offers more standout features than you can see at first. The glass is Tritan crystal to give it delicacy and finesse, and it also has titanium and zirconium to strengthen it and stop it from breaking, chipping, and scratching. Even though these glasses are delicate, you still get the convenience of being able to put them in your dishwasher. Finally, they are made in Germany and come with a higher-than-average price tag to accentuate their high position on the market. Treat yourself to highball glasses from Schott Zwiesel today. Even though it’s risky business to order this highball glass set and hope it gets to you in one piece, it’s worth the risk. 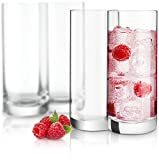 Once they do arrive, you will see they are stylish highball glasses that will take pride of place in any kitchen or bar. When you buy them, you get a set of six – all who hold over 12.6 ounces of liquid. However, there are also 13 size options in total in case this highball glass is not what you need. They are all made in France, feature Picardie tempered glass, and are two and a half times more resistant to breakage than other brands. However, the secondary packaging and the thin rims mean those breakages may be more prevalent than you hoped. That slight negative aside, you are going to enjoy the thermal shock resistance, the fact it’s non-porous, and that you can put it in the dishwasher or microwave. These high-quality highball glass sets are worth a closer look. If quality and style mean more to you than an affordable price tag, then set your sights on this beautiful set of six highball glasses from Le’raze. Even though they are far more expensive than several other sets on the market, they can be worth every penny. They are heavyweight with a solid base, and while they won’t suit children, they will be perfect for clumsy adults. They also offer a beautiful leaf and twig design that will get your creative juices flowing. Appreciate the European glass construction, thick glass, convenience of being able to put them in the dishwasher, and how they are going to last the distance. When you choose to buy a highball glass from Le’raze, you are unlikely to feel disappointed. 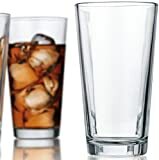 If you can get past the fact that the capacity of the glass is not the 17 ounces as advertised, then you are sure to find this highball glass set more than meets your expectations. You can go as far as to say it exceeds them. Enjoy a set of four glasses for a reasonable price, all of which are dishwasher-safe while arriving with free stainless-steel straws. Be more environmentally conscious and stop buying plastic straws! All four of the glasses are well made, clean, and have a sleek and striking style. They are also ideal for summer drinks – either in your bar or home. If you don’t have a dishwasher, you may find getting a cloth inside to wash them is a challenge, but it’s also not impossible. All in all, there is very little not to love about this highball glass from Bar Essentials. One of the major problems you can have with a regular highball glass set is that you don’t know which glass is yours. When you have a few friends around, you can end up swapping drinks which is not safe. These highball glasses from Red Co. are a game changer. Each one has a rippled bottom and colored glass. The glass itself also holds the color, instead of being painted on. The colors are not the only things to attract your eye, but the glass shape too. The rippled bottoms are a unique and welcome touch, while the curvature of the glass all the way up is favorable also. However, when it comes to cleaning them, their shapes prove to be a problem. A dishwasher’s water angle doesn’t reach inside, and you have to be gentle when you wash them by hand due to the fragility of the glass. These glasses are beautiful, affordable, and made for entertaining, but you do need to be careful with them. They are also smaller than they look in the photos online. 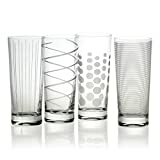 Many people like to go shopping for a highball glass set in physical stores so you can touch and feel the glasses. There’s nothing wrong in doing this, but for those with no time to spare, shopping online for a highball glass can be the only option. Your risk of buying a set you don’t like is high, but if you consider these criteria below, you can increase your chances of being happy with what arrives in the mail. The most important thing to consider, before you buy any glasses online, is the size of what you need versus what is on offer. If you like your current or old glasses, then stick with that capacity. Often, the size of a glass in a picture online looks dramatically different to what it is in person. Ignore the picture and focus on the ounce capacity in the description. How many glasses do you need? Are you a small family, a couple, or one person? Or, are there several of you at home, an event, or a wedding? Some glasses cater for families and events, while others tend to be more suitable as display pieces or the odd glass of sherry on a Friday evening. It can be challenging to see in photos how thick the glass material of a highball glass is. If you’re clumsy, thick glass can be important. Read the description to find out what the manufacturer classes it as. Then, read the customer reviews. Any disgruntled customer will happily let others know whether a glass is too thin and breaks, but a happy one will tell you if it’s thick and long-lasting. If you’re busy, then the last thing you want to do is separate your glasses from your dishwasher and wash them by hand. If having robust glasses that handle a rinse cycle in the dishwasher is important to you, then ensure you read supplier instructions properly. Finally, consider the unit rate. The overall price tag might seem reasonable, but is it when you compare it to the number of cups and the shipping cost? To see if a cost is reasonable, divide the final figure by the number of highball glasses. You may find your “bargain” highball glass set is not the deal you thought it was.